Like the “Amazing Race” television show, students work in teams completing various tasks in different locations. A winner emerges when the first team reaches the last location and completes the final challenge. This activity will take between 1-2 hours depending on the number of teams, the number of and distance between challenge locations, and the difficulty of the challenges presented to the students. The game works like this: Students divide themselves into teams of 3-5 individuals. A map of the area to be covered is provided to the teams. Initially, a challenge is presented to the teams, and students are released to the next challenge in the order that they complete the initial task. The location of the next challenge is presented to the students in the form of a riddle. Once the students reach the correct location, they complete a challenge and are then given a riddle that, when solved correctly, will lead them to the next location. In our Amazing Race, there are typically 6 locations; Challenges typically included are: an egg toss, a three-legged race, frisbee golf, a playground challenge, a water-balloon toss, and a trivia question. Arms Linked – Standing Up. The students break into groups, sit on the ground back-to-back with their groups, then link arms. Each group must figure out how to get their entire group to stand up without ever breaking the arm links between them. This could mean everyone tries on their own to stand, or that everyone braces against each other to all stand up together, or one person gets up and pulls up the people beside them, then those people pull up the ones beside them, and so on. This can be adjusted depending on the size of groups, and can start with pairs of people, then merging groups together at each round to end up with everyone in one large group at the end. This activity ranges from 10-20 minutes, depending on group size. This activity is similar to Minesweeper. Blindfolded participants must navigate their way through a minefield of boxes. In order to accomplish this, participants’ teammates must communicate instructions to them in order to avoid touch/stepping on any of the boxes. If a box(mine) is set off, the participant must go back to the starting position. Team sizes range from 2-4 people and the duration of the activity is usually around 30 minutes. This game emphasizes alternative methods of communication and how important it is to accurately and effectively communicate with others, especially team members! For this game all you need is a paper, pen or marker, and students. Each camper is given a piece of paper with a number on it. Each camper shouldn’t look at their paper and they should place it on their forehead to show everyone else. In the first level everyone is allowed to talk, but not say the number. In the second level everyone is not allowed to talk and should direct others using motions or other methods. For the last level everyone is not allowed to talk or use their hands to show numbers. The goal of this game is to have everyone line up in increasing or decreasing order, have evens on one side and odds on the other, and etc. The goal should get incrementally harder as you pass each level. Dizzy Lizzy – Part icipants must lean over and place their forehead on one end of the bat and spin around 3-5 times. (This is very effective and students get really dizzy.) Then they must run about 20 feet and cross the finish line. Once they cross the finish line, the next person in line gets a turn. The team that gets all of their members across the finish line wins. Sack Race – In this game, participants place both of their legs inside of a potato sack (or trash bag) that reached their waist. The goal is to jump forward and cross toward a finish line. The first person or team to cross the finish line wins. 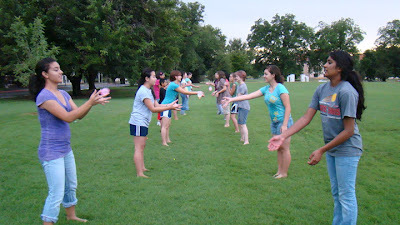 Water Balloon / Egg Toss – Participants pair up and toss either a water balloon or egg to each other. Each time they successfully toss and receive the balloon, both team members must take a step backwards. If the balloon is dropped the team is eliminated. The last team standing wins. Water Balloon Fight – Fill up a bunch of water balloons, and let participants engage in a water balloon war! Balloon Stomp – All participants must tie a balloon to their ankle with a piece of string. The goal of the game is to eliminate competitors by stomping on their balloons and popping them. The last person left wins. Big Foot – All you need is empty 12-pack boxes of soda. Participants “wear” the soda boxes on their feet, and have to run across the finish line. It is important for students to know that we sincerely care about them and their learning experience with us at YWiC. This an activity that we do first thing with our students on the first day of camp to help us learn their names and interests, and to help students learn what they have in common with each other. This activity takes 30-60 minutes depending on the number of students and instructors. Everyone is given a blank notecard and a pen or pencil. Each person secretly writes three unique facts about themselves on the card. Once everyone is finished writing on their card, instructors collect the cards and randomly order them. Then, one or two instructors take turns reading the information on the cards aloud, as the others try to guess who the card is describing. Once someone correctly guesses who the card is describing, or if everyone gives up, the correct individual stands and says his/her name. This continues until all of the people have been named. To increase the difficulty, and the fun, of this game: After each person stands and says their name, one or more instructors will attempt to remember and say each person’s name from the beginning. After the last person has been identified, the instructors will start at the beginning and say each person’s name in the order that they were identified. Everyone loves scavenger hunts, right? How about a Google-themed scavenger hunt?! YWiC’s research assistant and NMSU Google Student Ambassabor, Tasha Nesiba, developed a hunt with questions and facts about Google. The object of the scavenger hunt was to spell the word Google with letters spread out all over NMSU campus. Participants had to do six different challenges to receive a letter. The challenges included: creating a human Google logo, creating the Google logo with M&Ms, bean bag toss onto a Google Chrome logo, Google trivia, and a Google product match. Each team had the opportunity to use their creativity skills when doing some of the activities! The number one rule was to have fun! The first three groups to receive all six letters and present them to the staff won Google prizes! The scavenger hunt may take a lot of planning time. There must be predetermined locations, activities to do at each location, and clues or riddles to lead the teams to their next location. The duration of the activity may vary depending on the number of activities, the distance to each activity location, and the speed and competitiveness of the participants. This is a game/activity that helps students get to know one another. It may be applicable to session 2. The game is a mix between musical chairs and “Never Have I Ever”. The N students and teachers all sit in N-1 chairs arranged in a circle. The last chair is placed right in the middle. The person in middle gets to ask a question to everyone. For example, “Have you ever ridden a horse?”. Everyone who has ever ridden a horse must switch seats with someone else in the circle – even the person who asked the question. The person who does not get a seat in the circle will now sit in the center and ask the next question. The activity is simple and can last as long as it needs to. Kids love it because it allows them to move around, and there is a small aspect of competition. We have found that it is beneficial and extremely efficient to integrate a Core Concepts curriculum into our camp lesson plans. To review the concepts that we have taught our students and to gauge their understanding, we’ve developed a Jeopardy! game for the students to play during the last hour allotted for teaching Core Concepts. In 2012, our students divided themselves into two teams and prepared for an all-out battle! All of the students performed exceptionally well, demonstrating their mastery of the skills taught. With two teams of about ten students each, this game lasted for about an hour. To shorten or lengthen this time, you could divide the students into more teams, make the questions more difficult, or add in a Double Jeopardy! round. Back story: You and your friends are on a magic carpet, and while you are in the air, you realize that it is upside down! The carpet will not fly correctly or land if it does not get turned right-side-up. The goal is for you and your friends to flip the magic carpet over while you are in the air without having anybody fall off. The students all stand on a blanket/tarp that represents the magic carpet. Students must find a way to get the carpet flipped over without anyone touching the ground. The first time, the students can go ahead and try to solve it without any prior planning. Usually, they will find that it is difficult and communication is necessary. The students then get the opportunity to step off of the carpet and here is where the computational thinking comes into it, because they essentially have to come up with an algorithm that will help them solve the problem. Depending on the group size, it may be better to have 2 different groups, but the activity time ranges from 20-30 minutes. For the past two summers we have introduced a new game into our camps as a sort of fun setting for students to relax and play. Minute to Win it is a Television show where contestants have 60 seconds to complete a challenge using household items. Over the years we have set up and used this segment in our camps to blow off steam and enjoy the fun! The activities we selected were: Dum-Dum Dunk, Foam House, Battery Maze, Taste the Rainbow, Walrus, Face the Cookie, Bubble Blowing Baby, Tilt the cup, What a Racket, Cliff Hanger, Don’t Tip the Joker, and Pencil Game. These are just a small selection of challenges, there are hundreds more! Movie Night is an easy and fun activity for the campers to get to know each other and interact outside of the class setting. We treat Movie Night like a fun slumber party including pajamas, pillows, and blankets. During movie nights we also have an assortment of snacks and drinks like candies, popcorn, and ice cream to further enhance the movie experience! Some of the movies we’ve shown are Tangled, The Goonies, The Social Network, and films from the Harry Potter series. When deciding on what movies to show for Movie Night we usually pick out a couple and have the campers vote on which movie they want to see. Murder on the CS is a live interactive role play game designed by YWiC alumni Samantha McGuinn. This game is designed to bring girls out of their shells by putting them in the shoes of a character in the game, and having them solve a murder mystery using their deductive reasoning and social interaction skills. Each person involved in the game receives a character biography of the character they will have to portray in the game, and some characters have extra props and mannerisms they must use and fulfill during the game play. Every character has a set of goals they have to fulfill during the game, and these goals enhance the plot and game play. This game lasts about an hour, and is designed for groups with 13 to 25 girls. It has been played during both the 2011 and 2012 YWiC summer camps, much to the enjoyment of the campers. Download Murder on the CS here. In our summer camps, we usually have a large base of Harry Potter fans. This is excellent because many of our camp instructors are also Potter fans! As a result, YWiC holds annual “Potterlucks” during our summer camps where the instructors make magical-themed food items to share with the campers, and we screen one of the Harry Potter films. Some of the delicacies we’ve served include: chocolate frogs, licorice wands, golden snitches, skiving snackboxes, cockroach clusters, and frog spawn. This activity has become a huge hit with everyone, and usually takes 1.5-2 hours. This smartboard allows users to use a Wii remote from the Nintendo gaming system, along with an infrared pen, to interact with their computer on a projected surface – forming an interactive whiteboard system. The Wiimote can track sources of infrared (IR) light – this means that the Wiimote can track pens that have an IR LED in the tip. By pointing a Wiimote at a projection screen, a very low-cost interactive whiteboard can be created. The Wiimote can track up to four points, meaning that up to 4 pens can be used in the whiteboard system. When you use a pen on the whiteboard surface, the Wiimote communicates with the Pentabulous! software and your movements and clicks are interpreted and actions take place on your whiteboard. Students build their own pens and then use their pens to experiment with the system. The activity ranges from 30-45 minutes depending on student age and group size. Click here for detailed information about supplies, and here for more information about the system, how it works, and detailed instructions on assembly. High Ropes Course – Dangling 30 yards above the ground? A thrill for some, not so much for others. Still, the high ropes course, offered through the campus activity center, has been a popular event in the past and offers some fantastic team-and-trust building. This activity takes 1-2 hours. Rock Wall – Also run through the campus activity center, students can spend 1-3 hours exploring every aspect of this indoor climbing course. there are areas for beginners, offering more handholds, all the way up to overhangs that must be maneuvered for the experienced and daring climbers. Self Defense – Run through the campus police department, this can take anywhere from 2-4 hours. The trainers (often, police officers) teach several valuable skills for defense against an attack, as well as how to avoid situations all together. Pool Party – Several summer camps have ended with a pool party, hosted by the campus aquatics center. This activity can last any length of time, and can be a great final hangout on a New Mexico summer day!